Where to Play Bridezilla for Real Money? We’re not exactly sure what the target audience of Bridezilla is, however it is quite clear that this slot is the result of the developers running out of ideas and rummaging through their idea bin which they fill up with otherwise ridiculous suggestions, possibly under the influence of copious amounts of alcohol. 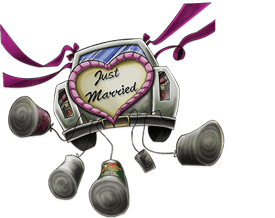 Microgaming’s odd slot game centered on an insufferable bride tormenting the groom on their wedding day, presented in a low-budget, reserved manga style will leave players contemplating the real questions, like “what is the point of life” followed immediately by “what is the point of continuing to breathe”. This slot doesn’t really have any reason to exist, but it does anyway. We played it and compiled our thoughts below so you don’t have to! How to Play Bridezilla Casino Game? 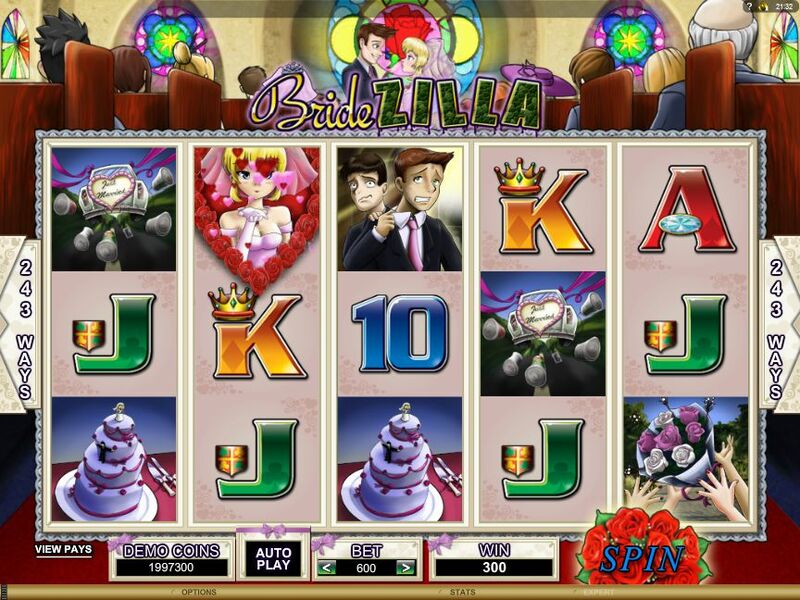 Bridezilla is a five reel, 243 payline slot. Because there are so many paylines, with most of them extremely easy to achieve, they provide really small payouts - the oldest psychological trick there is. These payouts are almost always smaller than the initial bet, but calling it a “win” spurs the player onwards. The betting range kind of makes it clear who Microgaming is gunning for here. The range spans 0,30 to a whopping 6. Yes, we didn’t make a typo. 6. This is extremely low, even in terms of the average lower-end betting ranges. 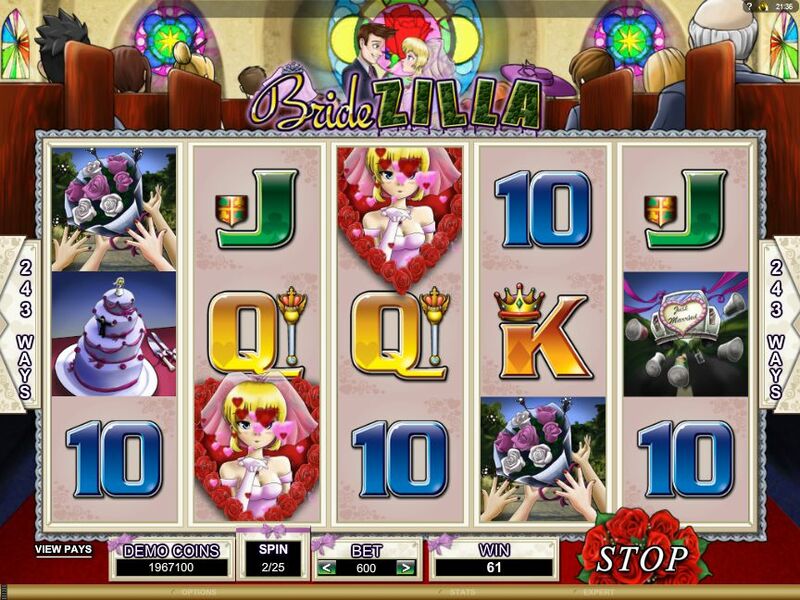 Bridezilla is basically the McDonald’s of slot machines, except it's even worse for your health. Don’t even get us started on the visuals. If you absolutely, unavoidably must play this thing, do it with a blindfold and put it on auto. The backdrop and the non-standard Microgaming symbols are atrociously drawn, trying to emulate the manga style but not really. The images are blurry, the interface is horrendous. This slot is basically visual assault. In spite of the project directive for Bridezilla during development presumably being “put as little effort and money into this as possible”, the slot did get a single play feature for posterity’s sake. 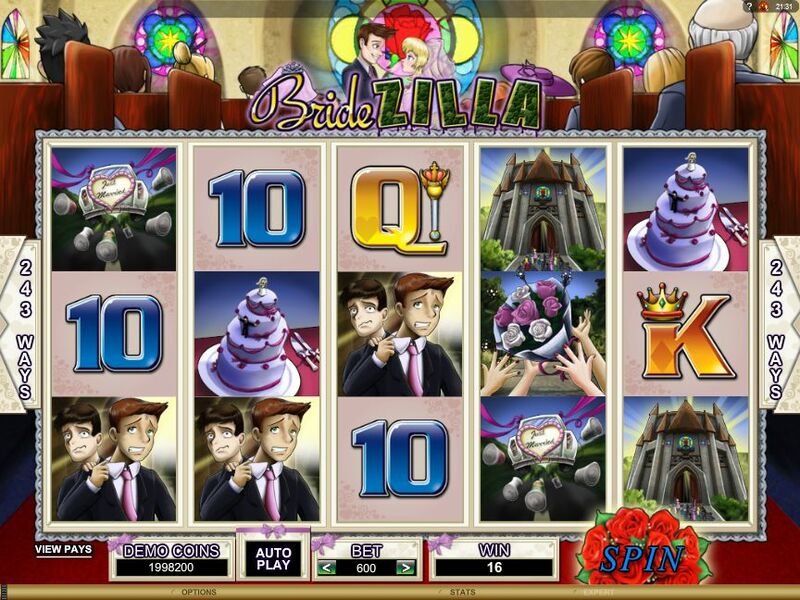 Intuitively called the “Bridezilla feature”, if you hit three or more Bell symbols, you’ll be random awarded 10, 15 or 20 free spins. While these are running, the eponymous bride will appear, and each time one of the free spins results in no winnings, she will get pissed (how are advocates of political correctness not all over this? ), rewarding you with some kind of bonus. These bonuses range from adding another free spin to your supply, doubling your starting bet or adding a payout multiplier based on how many special symbols are on your reels. Sure, free spins are cool, but having to suffer through said spins with the horrendous animation of the pissed off bride makes this more trouble than it is worth. This slot is exciting in the same capacity as Chinese water torture is exciting, or as going through a dental procedure without anaesthetic is exciting. The sole play feature succeeds in making you wish for wins, but not because of the payout - you just want to be spared having to watch the animation of the bride getting angry. You know what’s exciting? Closing this thing and doing anything else. Just don’t. This is the single worst slot we’ve reviewed so far. You’re literally better off with anything else. Play another slot at random. Go buy yourself a burger. Take up yoga. Anything. Really. Nothing here is redeemable. Not the art, not the payouts, not the play feature.